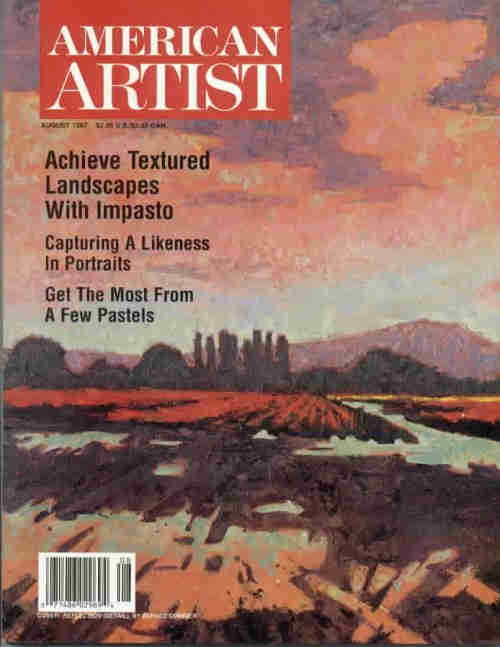 "Achieve Textured Landscapes with Impasto"
Every weekday morning Alfred Currier can be seen driving his heavily rusted 1964 red volvo to his studio two blocks off the business section of Anacortes,Washington, the town he lives and works in. He shares a studio in a restored 1891 church building once belonging to the town's founder. The peaceful surroudings and high ceilings make this an ideal work site to complete his large oil impasto land-and skyscapes. 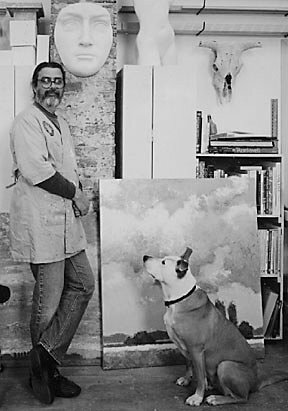 With thick glasses worn over soft brown eyes, a dark wide-brimmed hat, ponytail, and looking extra tall in jeans ripped at the knees, the painter can generally be spotted with his constant companion, Boo, a seventy-pound blond mixed terrier with a faintly pit-bull jaw. She sits in the back seat of his car, with her nose out the window, one ear drooping. "When we got her," the artist recalls, speaking in his slow, Appalachian baritone voice, "they told us she would be small enough for our condo. But she kept growing. She's so much a part of our lives now, what can I do?" He shrugs with a smile. Step 1: After texturing the canvas with Utrecht's professional-grade gesso, Currier begins painting with transparent washes. Step 2: The artist does a loose sketch of the subject Step 3: When blocking-in is completed, Currier and then blocks in the large areas. He begins the impasto stage by using Gamblin's G-Gell as a medium to combat the archival problems associated with using thick paint. Anacortes is located on Fidalgo Island, the first of the nearly two hundred San Juan Islands lying off the coast of northern Washington State. It's about an hour's drive north of Seattle on a freeway with a connecting bridge to the mainland. The town also nurtures a thriving arts colony. In second-story studios, painters, sculptors, and writers pursue the muse above the bustle of commerce below. Art galleries, art walks, and a summer arts-and-crafts festival showcase regional artists. Currier likes to paint the Northwest-its evergreens, cascading waterfalls, freshwater fishermen, field workers, old-growth, forested hiking trails, and ever-changing skies. He often packs up his easel and paints, and he and Boo drive out on location to capture the mood and power of the region. This can mean dealing with rain, gusting winds, and rapid light changes. Often, the composition he chooses to paint is gone in seconds. "On-site, I use whatever approach I think will preserve the subject long enough to capture its essence so I can make a painting of it," he notes. "Sometimes it's a pastel or graphite sketch, sometimes a quick oil study, and other times a photograph. I like plein air sketching because I can respond directly to the subject, irrespective of composition and details. When I return to the studio, I then plan out my work; but in my drawings and photos, I've preserved the spontaneity and freshness of being on a location." 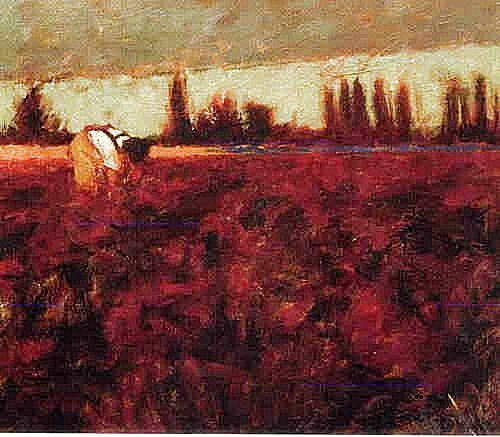 "The Gatherer" , 1993, oil, 40 x 44. Courtesy Patricia Rovzar Gallery, Kirkland, Washington. 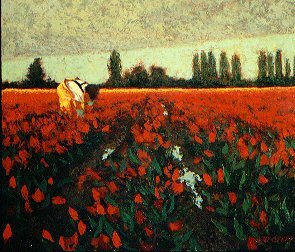 Each spring, the fields near where the artist lives fill up with tulips. Workers hurry out to pick them. 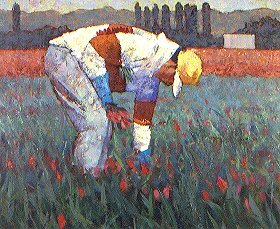 Currier says of this painting, "I spend a lot of time in the tulip fields sketching. At first, the workers shied away from me, but when they got used to seeing me, they loosened up. It's backbreaking work. I find them fascinating. They work so close to the Earth, they're almost of it." Currier loves the area's kaleidoscopic horizons. High winds keep the clouds moving and forming new shapes and colors. As a former sailboater, flyer, and cyclist, he thrives on the weather's turbulence, and, as an artist, he relates to the changing colors-the pinks, yellows, and mauves of morning skies, the magnificent red and orange sunsets, and the violets of the island rising up out of the mist. The morning light casts elongated shadows over fields and farmlands, and the wind keeps the atmosphere charged. 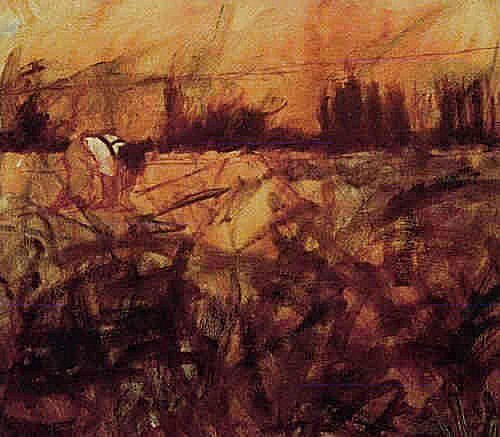 Currier's work can be distinguished from other Northwest painters by his unique palette. He often uses color complements against each other to create tension in the painting instead of the saturated, monochromatic tones often associated with painters of the region. "I like to use color-temperature changes rather than shifts in values to define form," he explains. "This procedure allows me to put many colors into an image and still retain its identity. For example, a cloud containing reds, violets, and yellow will remain clearly distinct from adjacent multicolored clouds." "Flea Market", oil, 48 x 36. Courtesy Waterworks Gallery, Friday Harbor, Washington. Currier says he was captivated by the two women pictured in this painting. They shared a closeness that comes only after many years of friendship. The light was bright, so he made it a dominant aspect of the work, and he put the figures in shadow (after all, they share secrets no one else will ever know.) He chose cool blues, roses, and yellows in the rest of the painting to suggest a morning in a hot climate. Currier begins a painting by treating the canvas with a thick coating of Utrecht professional-grade gesso, which he applies with a coarse brush using sweeping gestures to create texture. A good portion of the textural effects on his canvas are created at this stage. Next, he applies pigments thinned with mineral spirits in transparent washes over the entire canvas. When the washes are thoroughly dry, he sketches in the major forms. After the initial block-in is dry, Currier than mixes and applies a variety of warm and cool hues to each plane of color, keeping the same value within that plane. He builds up the texture in layers with large brushes or a palette knife, remembering to paint fat over lean, and keeping his darks clear and thin while thickening the paint as he starts adding lighter tones. To combat archival problems common to impasto, such as cracking, the artist uses Gamblin's G-Gell as a medium. 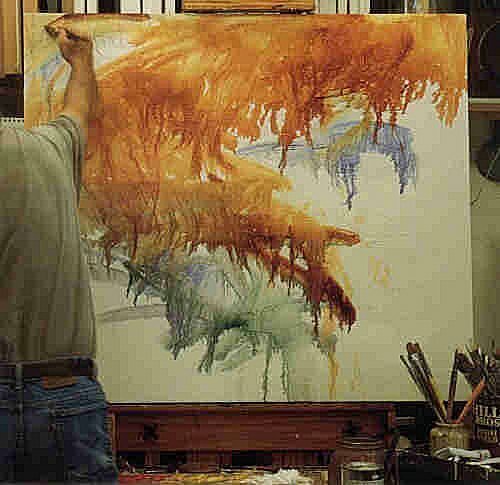 The artist paints with Gamblin oil paints, and his palette is made up of flake white, Naples yellow, cadmium yellow, cadmium red light, cadmium red deep, alizarin crimson, transparent earth orange, perylene red, yellow ochre, cadmium green, cobalt blue, viridian, and ultramarine blue. He uses Grumbacher bristle brushes. "Bieres", 1994, oil, 40 x 44. Courtesy Lawrence Gallery, Sheridan, Oregon. 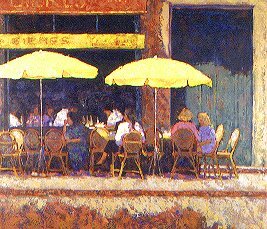 Currier created the contours for the brilliant yellow umbrellas in this painting with pinks and greens without compromising their shape. The umbrellas seem to be floating away from their background. The viewer can sense the air pushing up underneath them, ruffling their outer edges. 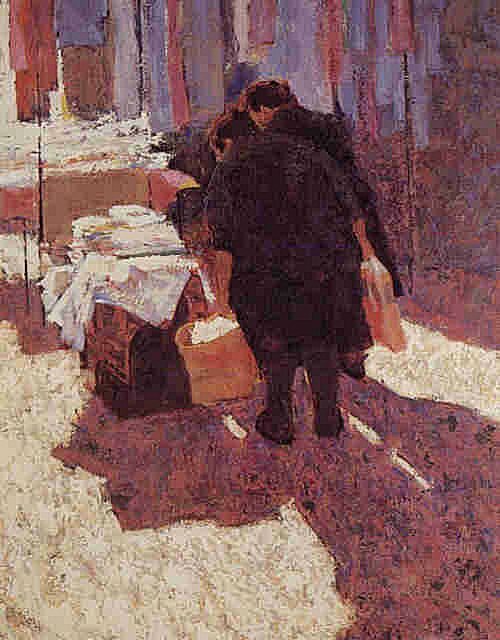 Currier received his formal education at Columbus College of Art Design in Ohio and the American Academy of Art in Chicago, where he earned his degree in fine arts. His works can be found in numerous private and corporate collections. The artist is represented by Insights Gallery in Anacortes, WA, and the Lawrence Gallery, in Sheridan and Portland, OR.